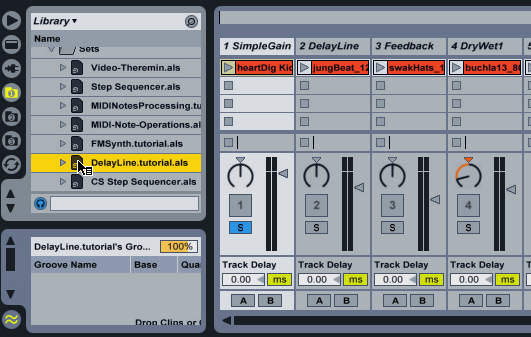 The beginning Max for Live tutorials are presented as a series of Live Sets. 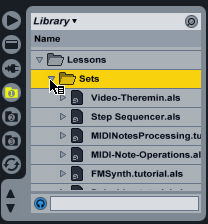 These tutorial sets include a sequence of tutorial devices - one device per Track. Each set explores a specific topic that covers how Max for Live itself works, and how different kinds of devices are constructed. The tutorial devices are arranged in order, from simple examples to more complex patches, Each tutorial device is a fully functional Live device, and each subsequent tutorial develops and expands upon topics covered previously. Click on the arrow to the left of the folder marked Lessons. 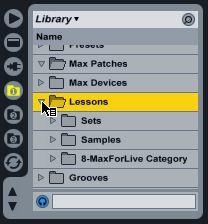 Click on the arrow to the left of the folder marked Setsto show the Lessons sets. Each lesson will be displayed as a session document. To load a tutorial, double-click on a Live session document. 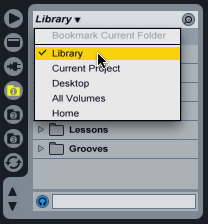 All of the tutorials in the lesson sequence will be loaded as separate tracks. To view a specific tutorial, click on a track. 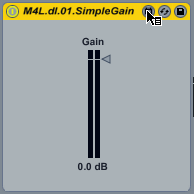 The tutorial patch will appear in the Live device rack. Click on the Edit button in the Device Title Bar to open the device and launch Max for Live. To see the tutorial text, click on the Patching/Presentation button located in the toolbar of the Max Patching window.